CORNWALL ONTARIO – The September 2017 issue of the Good Times magazine has two short but very informative articles as well as other very interesting ones. “Stroke Strategy Dents Dementia” states that Ontario’s stroke prevention strategy ( since yr. 2000) found an unexpected drop of 15.4 % in new dementia cases while analysing data collected on 5.5 million Ontarians from 2002-2013. The number of first-time strokes in the age group of 80+ highest risk group dropped by 37.9%. It states that key issues seem to be eating a healthier diet, exercising regularly, avoiding tobacco and if necessary, taking medication to control high blood pressure. 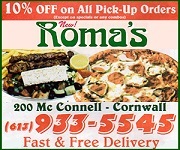 The source of the article was “Alzheimer’s Dementia: The Journal of the Alzheimer’s Association”. The second article, The Brain Health Food Guide” was created by experts in scientific research at the Toronto Bay Crest Health Sciences. You can download their pamphlet, “Brain Health Food Guide: An Evidence-Based Approach to Healthy Eating for the Aging Brain.” The article cites two tips: choose leafy greens at least once a day and eat fish, beans and nuts several times a week. You can use the search function on baycrest.org to get a copy. It is very interesting and informative. This wonderful old photo of Trinity Church Sunday School gathering was sent to me by Myrna Plumley-Watt. The occasion is Flower Sunday, June 20th, 1949. Those were the days when the girls and women all wore hats to church. The children have bouquets of flowers. The group would walk on Flower Sundays to the Trinity Anglican Church around the corner on Second Street and lay the flowers on the steps in front of the first pews below the altar. The flowers were later taken to a nursing home or hospital for the patients, if I remember correctly. . It is difficult to identify some of the children and adults but with Myrna’s and Francis Glass-Irwin’s help here are a few: in the middle far back are three gentlemen. The tall man on the right is Frank Glass, Fran’s Dad who was Sunday School Superintendent for a number of years. The man to his left may be Bert Yates. Fran’s Mom, Viola, is in the back row 6th. from the left in a black hat. She was a Sunday School teacher. 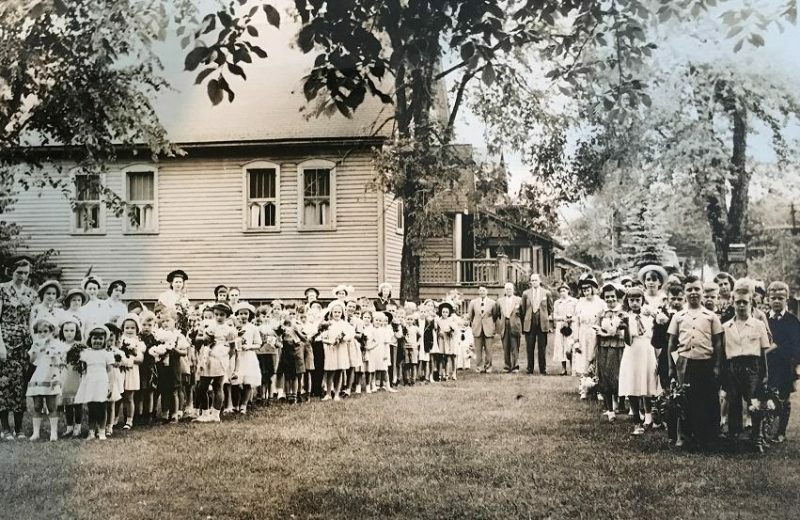 Myrna is in the front row on the left side in a white dress and hat holding flowers about 6th from the little boy in the sailor suit near the men. Just to the right of Myrna may be Francis just behind her. Fran’s sister Judy (about 4 years old) is in the front row 5th from the left. I am not visible anywhere but am sure Sandra Aguirre, my younger sister Evelyn and I were there…somewhere. It was always a wonderful occasion. The site of the former Trinity Church Sunday School now houses the Beek Lindsay Seniors Residence at 210 Augustus Street. Shorthand always intrigued me. It just seems an impossible thing to learn and use and then be able to read what you wrote. But it was used for many years. Then replaced I guess with equipment such as the Dictaphone and now we even have voice recognition. A secretary told me that she wished she had retained it because it would come in handy in some meetings. 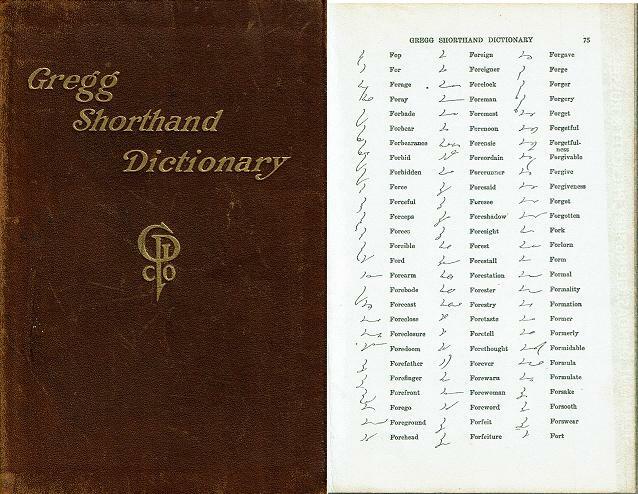 This book I inherited, titled, “Gregg Shorthand Dictionary”, by John Robert Gregg was first issued in 1901. This is a 1916 edition, published by The Gregg Publishing Company, NY. Credit for the Shorthand Forms is given to Alice Rinne Hagar. This particular page deals with the words starting with “F”. Amazing!! Quite a skill to learn. Do you have a family member or friend who you believe consumes too much alcohol? Do you feel isolated alone, scared or discouraged and do not know what to do? The District 27 Al-Anon Group is hosting a special day of awareness about Al-Anon Family Groups and its fellowship. By attending this upcoming event and finding out more about how this fellowship continues to grow, will give faith, hope, one day at a time to families and friends who are and have been affected by the family illness of Alcoholism. 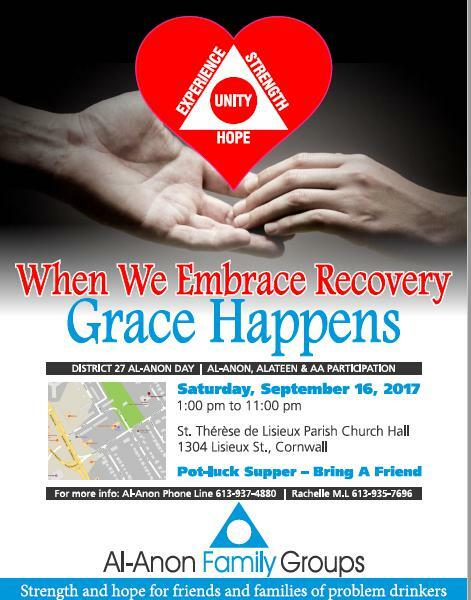 According to the Press Release I received from the District Representative of the #27-Seaway Valley Al-Anon Groups, Rachelle Menard-Lefebvre, this “A” day is a time to share experiences, celebrate recovery stories, embrace lifelong friendships and bring the community together. I have personally attended such events over the years and they are interesting, informative, very helpful and always fun. 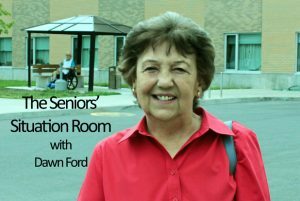 For more information please call the Al-Anon phone line at 613-937-4880 or contact Rachelle at 613-360-7618 or 613-935-7696. Hope to see you there…and bring a friend. The Glengarry Highland Games are now passed but they always bring back memories of past ones I attended. I always loved the Tattoo on Friday nights when all the bands come onto the field. It is exciting and wonderful and makes you feel like a kid again. It is a beautiful photo. She is probably about 7 or 8. 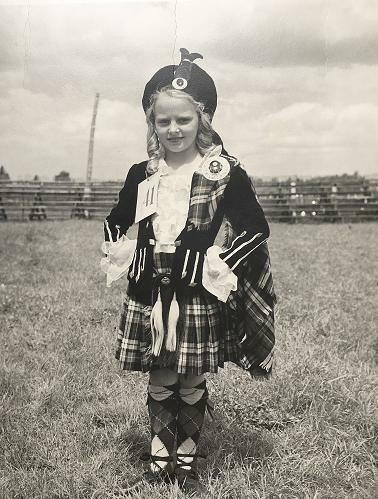 I also remember that she danced not only the Highland Fling but also other dances such as the Sword Dance and Sailor’s Hornpipe. As young as she was, she was an exceptional dancer. Seeing this lovely photo brought back a lot of great memories of the old days at the dance studio. I remember the lessons were in the basement of the Dickson’s house. The walls had painted murals of Disney characters which was always fun. A group of American tourists entered a 300 year old pub in Cork, Ireland. One of the Americans said in a loud voice, “I hear you Irish think you are great drinkers. I bet $5000 that no one here can drink 20 pints of Guinness in 30 minutes. The bar was silent but the American noticed one Irishman leaving the pub. And no one took up the bet. “Sure”, said the American. “20 pints in 30 minutes for a bet of $5000”. “Grand”, replied the Irishman. “So, pour the pints and start the clock”. It was very close but the last drop was consumed with 15 seconds to spare. “Ok, Yank. Pay up”, said the Irishman. Great column.I remember Myrna in her kilt-she was an exceptional dancer. Good work, Dawn.